While overall cancer rates have slightly declined over the last 10 years by about 1 percent continues to be a major scourge of our society. The American Cancer Society projects that about 1.6 million Americans will be diagnosed with cancer in 2012 and about 577,000 people will die from it. This means that roughly one third of those diagnosed will die within five years or less in spite of medical care. Stage 4 cancer refers to advanced cases where the lymph system and glands are affected, and the cancer has metastasized, or spread, to other parts of the body. Once a patient is diagnosed as Stage 4 they have the choice to keep fighting the cancer with stronger and more toxic methods or to seek alternative healing methods. I work on-call at an alternative cancer clinic in Phoenix that specializes in treating Stage 4 cancer cases. Patients come to our clinic from all over the US and abroad seeking treatment after traditional oncology has failed. They receive low-dose chemotherapy (IPT) and an array of supportive therapies. I offer acupuncture and Microlight energy medical services. I do not claim to cure or treat the cancer directly, as that is addressed by the medical staff at the clinic. My services focus on pain relief, emotional healing and energetic balancing therapies. I aim to support my patients with better organ function and improved energy levels and immune function. I have seen many positive and touching effects from my therapies, and would like to describe some of the methods, with a case history. In the cases of both cancer and auto-immune diseases the body is in a self-destructive mode. The normally beneficial functions of cell replication and immune protection go into overdrive in ways inappropriate to health and survival. Most medical therapies focus on using various forms of chemo-therapeutic and immune-suppressive drugs to prevent further damage. These are useful, but limited in that they are not addressing the root of why the body is acting against its own survival. It is well worth looking into the realms of mind-body medicine to seek solutions that better address the causes of these diseases. When we do this we will often discover unresolved emotional trauma, build-up of toxic chemicals and major life lessons connected with the presenting disease. How can you "read" these underlying causes of disease? One of the most direct and useful ways is through assessment of the chakra system. Even more useful is integrating chakra evaluation with acupuncture organ/meridian diagnosis. Each system offers vital information about the inner workings of the body/mind, and when integrated together provides a very clear picture of what is happening and how to create an effective treatment plan. Chakras are energetic transformers that convert high-frequency energy that I will refer to as universal energy down into various levels of lower frequency energy. Why do they do this? It is because the various systems of the body require different energy frequencies to thrive. The higher-vibrational energy that supports cerebral higher brain function would not be sustainable for the intestines and reproductive organs. 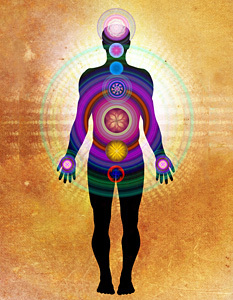 Therefore, the chakra system steps down the universal energy to levels comfortable for these organs. The healthy chakra system also embodies the mandala – the circle that is a symbol for wholeness. You can see this for yourself by asking a friend to lay down on a table facing up. Place a pendulum over each chakra center and watch. You will likely see the pendulum start moving in a clockwise circle above the healthy, balanced chakras. In the case of cancer patients or others with disease the pendulum will move in other patterns. These could include horizontal line back and forth, counter-clockwise circles, diagonals or a cloverleaf pattern. You can learn to interpret each of these to help indicate the emotional patterns that may be at the root of the condition. You will get even more information if you then perform color testing to determine which therapeutic color will correct the distorted pattern and bring it back to the clockwise circle of wholeness. There is a keynote quality for each color, and you will learn a lot from seeing which one brings the chakra back to wholeness. I have developed a system of chakra testing and balancing called PNE Therapy. There are often clear correlations between imbalanced organs found through TCM diagnosis with the distorted spins of the chakras. These correlations can point the way toward understanding the patterns the patient is running that has been underlying their disease. There is no one treatment technique that will ease these patterns – it usually takes a combination approach to support the patient in moving into a true healing process. I use the term multi-modal therapy to describe a combination approach used in my practice. The techniques used include microcurrent electro-acupuncture, color light therapy, essential oil therapies, sound therapies and acupuncture. Each of these individually has great power. When used in combination the beneficial effects are often multiplied. There are many acupuncture points that have Chinese names indicating their effects on the spiritual/soul level. The most useful sources I have seen for the "spirit of the points" have been the writings of J.R. Worsley and Lonny Jarrett. I commonly treat a few points with needles or microcurrent as part of multi-modal therapy, and believe that this anchors the results of PNE balancing and helps the patient integrate the energetic shifts that happen during the session. Easing pain – this is usually done with a combination of microcurrent electro-acupuncture techniques and auricular therapy. Helping determine the underlying energetic pattern and offering systemic balancing – After evaluation I usually do this through the Eight Extra Vessel master points, meridian tonification/sedation points and PNE (chakra) balancing using color light. Such systemic therapies can strengthen depleted cancer patient’s constitution and immune response. Empowerment – I try to enlist my patients to continue to practice toning, breathwork and journaling between sessions. This empowers them to be a leader in their own healing process – and they often have many "aha" moments. The effectiveness of all these methods is enhanced by combining them with simultaneous microcurrent, light and sound therapies. These help them impact the body more directly and to open clearer access to the emotional "control panel." Ann, Woman, age 57. Diagnosis – ovarian cancer, had surgery two years before. Ann now complained of pain in her back difficulty walking, constipation and swelling in her thighs. Emotional description – Needed better boundaries and self-love. She understood that she had taken on emotional pain and issues of her teenage adopted children into her own body. Findings: Tongue swollen, pulse showed middle burner weak. Sacral, Solar and Heart chakras showed imbalanced spin patterns. Weak Organs – Spleen, Triple Warmer, Ren 5 test point. Step One – Needles in TW3, TW 10, Sp 3 and Sp 5. This is a Polar Meridian Pair balancing pattern from Japanese acupuncture – combining treatment of two Organs opposite on the Chinese Clock. Step Two – Needle treatment of Ling Ku combination on right hand for opposite back and leg pain. Step Three – Root treatment with Acutron microcurrent and light therapy using Violet light to balance Spleen function. Followed by Branch (symptomatic) Circling the Dragon treatment on painful leg areas for local pain relief effect. Step Four – Reverse Body Image microcurrent electro-acupuncture therapy for hip pain. This involved placing using polarized probe therapy, placing + probe on painful hip points and – probe on upper chest reflex points for the hip. I gave her a custom essential oil blend to place on her chakra points and smell several times a day. After this treatment she reported feeling "much better." This was two days after first treatment. Ann reported more mental positivity, reduced constipation and good, but temporary back pain relief. Findings: Pulse weak on Kidney Yang position on R hand. This time Urinary Bladder and Small Intestine Organ test points showed weak, Spleen was stronger. Solar Plexus and Heart chakras still showed distorted spin patterns. Step Two – PNE therapy on Solar Plexus chakra with Purple light, Magenta light (no current) on front and back of Heart chakra. Step Three – As part of PNE Balancing, I guided Ann in connecting with and dialoguing with her inner child while focusing on her lower abdomen (Sacral chakra). She had memories of a cruel aunt who had taken care of her during early childhood and who was very critical and had withheld love. Ann’s inner child spoke to this aunt and verbalized her feelings that she had not been able to verbalize at that age. She spoke her mind and when she felt clear I guided Ann in forgiveness practice with the aunt and herself. After these steps of treatment Ann had a big emotional release experience. She told me that all her pain was gone and that she felt very light. This short article can only introduce what is a very valuable approach for treatment of cancer patients as well as a wide variety of patients with other chronic pain and disease conditions. While most patients are aware of their surface emotions they are not as commonly in touch with the deeper causative levels that have helped create their life path culminating in their current issues. Multi-modal therapy using the energy medical modalities mentioned in this article is extremely valuable for establishing a true healing dialogue, both between the practitioner and patient and between the patient and their own inner self. The combination of acupuncture on selected points with color light therapy on the chakras has powerful effects at bringing hidden, blocked energies to the surface and facilitating positive transformation and release. This system of multi-modal therapy can provide valuable support for other medical and complementary and alternative therapies.